Finding the perfect way to design a home when there isn't much space to use can be extremely challenging, but it doesn't mean it can't be fun. There are many ways to make the space be very cozy but not crowded. Here are a few home decor ideas for small homes. Because there isn't much square footage when you are coming up with home decor ideas for small homes, this is the perfect opportunity to think about using the height in the room rather than the width. For the kitchen experiment with tall open shelves. Buy fun storage containers that show a little of your personality. It's a great way to be functional yet decorative. The living room is one of the most important rooms in any home. One idea to use the space is to buy or make an alternative style bookcase or go for the full floor to ceiling bookcase. Paint the walls white or light colored. This will allow the light to bounce off leaving the room feeling brighter and more spacious. Perhaps have a strong focal point in the room such as a painting, so the attention isn't on the lack of space, rather on the art. Have furniture that is multi-functional. Find end tables that can be used as a bar, a couch that has storage space underneath, or a footrest that has storage built inside of it. Often the space under the stairwell goes unused as well. 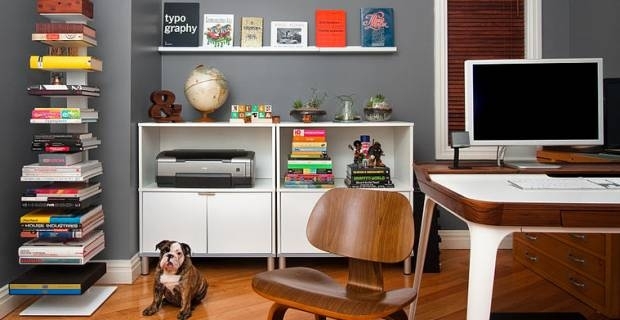 This is the perfect space for a bookshelf, extra storage, or a mini office space. These are just of few of home decor ideas for small homes. Try out different colours and furniture to see what works best for you. It can always be changed around if it doesn't seem to be working for you. Check out more websites and magazines for more creative ideas.